Bletchley station is another of those in the mould of Ashford, which are all concrete and no character. Plus there doesn't seem to be any toilets on the platforms. It's a very windswept station today and is pretty quiet. We leave from platform 6 on a West Midlands unit, which has been drafted in by the new franchise of London Midland, which started operating just a week ago. We are next to a gravel yard just east of the station, and then leave the West Coast Main Line to go on single track. We go past the carriage sidings on the left, which contains an old shunter, and then under the flyover, which carries the line from Bicester and Aylesbury, (currently mothballed). We pass more empty sidings and the carriage shed with several units in them and then is joined by the track from the flyover on the right. We then go along an embankment, looking down on a mixture of supermarkets, factory units and modern housing. We then pull into Fenny Stratford station, which has a bus stop shelter, though the original yellow brick station building is all boarded up. We then go over the Grand Union Canal and the A5 trunk road before we come into open countryside. The track now doubles as we pass some newly built office blocks and then stop at Bow Brickhill station. It has two platforms, but they are separated by a level crossing. This seems to be a feature of most of the stations on this line. The guard then comes along the train to check our tickets. The countryside is mainly open fields on the left with woodlands in the distance on the right. Some new housing appears on the left as we slow down to stop at Woburn Sands station. The original station building is now a private dwelling. We are soon back out into the countryside again, passing ploughed fields and scrubland, but soon stop at Aspley Guise. It has another old station building, looking a bit like a church, but is also boarded up just like Bow Brickhill. 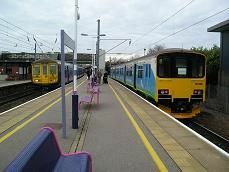 Again its two platforms are separated by a level crossing. Apart from a few houses on the nearby hill, this is a true countryside station. We move away but don't go faster than 30 mph as we continue past rough grazing land and then some light industrial units. We pass under the busy M1 motorway, with a sign that says 14 miles to Luton and 44 miles to London. We now pull into Ridgmont station, which has lots of redevelopment work going on here. The station building is still standing but is empty. A large warehouse for Amazon books is on the left and dominates the skyline. We then go into a cutting before emerging into hilly scenery on the right and a wide open plain on the left, which contains a lake and some woods in the distance. More houses by the track indicate that we are approaching Lidlington station, which has been rebuilt and again has two platforms, separated by a level crossing. It has a blue painted bus shelter and to the left of the station there are lots of new houses. We are soon out into open countryside again, this time there being more woodland. We pass the Millbrook car test track on the right before coming into Millbrook station. It's a very nice station, with the original station house lived in and being kept in good order, though there isn't a shelter for passengers on either platform. There is an open quarry on the right, which is partly filled with water, whilst a conveyor belt runs round the perimeter to a bridge, which goes over Stewarthy station and into the brick works factory on the left. Again the two platforms are separated by a level crossing. There are several sidings on the left just after the station and 66063 is waiting in the yard to pull a train out onto the Midland Mainline not far ahead. We then go back into open fields for a short distance, before stopping for Kempston Hardwick station, which actually has both platforms adjacent to each other. There is a still a level crossing here. There is an old airfield next to the station, but large new factories have been built on part of it. We are now on the outskirts of Bedford as we pass more factories and more houses. We now pass under the Midland Mainline on our right which runs from St Pancras to Leicester and beyond. There are houses on both sides of the track now and then there is a large area of wasteland before we come into Bedford St Johns, which was originally the main station for Bedford. It was moved from its original site in 1984 and is now just a single platform with a blue-framed shelter on its bare platform. We pass lots of empty space where sidings once stood and the line to Sandy once passed. There are signs of regeneration though with new houses being built in some parts of the wasteland. We then pass more sidings on our left with Southern and First Capital Connect units stabled in them. Finally we come onto the Midland Mainline and enter Bedford Midland Station.